Low Stanger is a small farm, but its location, topography and farming history have allowed areas of diverse flora and fauna to develop. We are committed to maintaining, and where we can, enhancing this biodiversity. Two areas of the farm form a County Wildlife Site, and these wetlands are grazed lightly and mown when possible to promote flowering plants. This in turn leads to a rich insect life, which then attracts resident and migrant birds. Farmland is always under the twin pressures of food production and conservation - in some ways it is an impossible problem to resolve. Our approach is to use some land for quite intensive production (the organic market gardens), and reserve some for wildlife and biodiversity, whilst applying a definite management at all times - this land has been farmed for centuries and should continue to be. Cattle aid biodiversity by grazing less selectively than sheep - traditional breed cattle thrive on poorer quality swards. 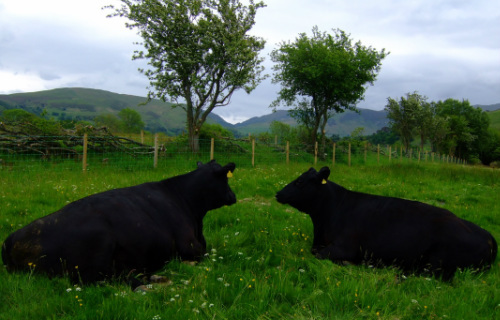 Our cattle are Aberdeen Angus. Hay meadows provide a valuable food source, as well as cover, for diverse life. They can also be a beautiful feature in the farmed landscape. We have restored around 7 acres of meadow with the help of Cumbria Wildlife trust, and make hay on a further 7-10 acres grassland. Hay making promotes biodiversity by allowing flower seeds to set, and the tedding action during the process scatters seed widely. 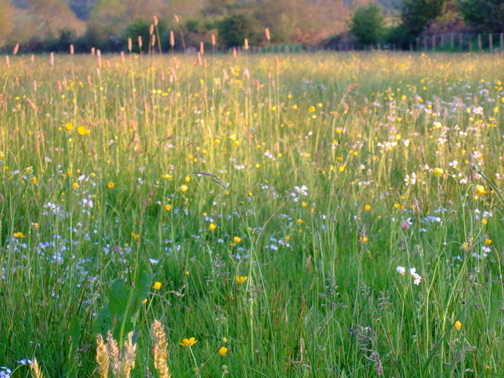 Hay meadows consist of annual and perennial grasses, and mainly annual flowering plants. The make-up of the sward will vary from year to year, depending upon the weather and also the success of plants in setting seed the previous year. A hay meadow is a transient thing - moving between more or less grasses, more or less flowering plants.